Leader of ACMC Rishad Bathiudeen MP speaks to the Press after giving his statement to CID on 12 December. The All Ceylon Makkal Congress (ACMC) said that they are committed stakeholders of Sri Lanka’s democracy and not striving to promote deposed PM Ranil Wickremesinghe as an individual. “We do not have any personal passion for the individual, Ranil Wickremesinghe MP. There is no ‘relationships’ between ACMC and the UNP either. We ACMC stand with UNP chiefly to safeguard democracy and to uphold our constitution that has been violated repeatedly-and we join UNP’s call against this violation” said the Leader of ACMC Rishad Bathiudeen MP on 12 December. “Some media have been wrongly reporting that ACMC is colluding with UNP due to our call to re-appoint Ranil Wickremesinghe as PM. We call Wickremesinghe’s return as PM not because of any personal passion for the individual Wickremesinghe nor due to any ‘relationship’ between ACMC and the UNP but because his removal is a clear violation of the constitution. All Sri Lankans are bound to act according to the Constitution and no one can violate it. The removal of Wickremesinghe MP from PM is a clear violation of the Constitution and this is where we say it is wrong. President’s sacking of the previous Cabinet too was illegal. Also President said that even if all 225 MPs say they want the deposed PM Wickremesinghe back, he would not allow it-which statement too was in violation of the constitution. We oppose all these anti-constitutional acts and statements by President of the country” added Bathiudeen MP. 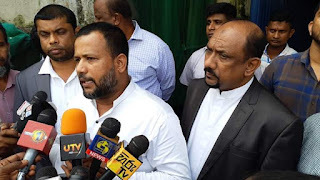 ACMC Leader Bathiudeen MP was addressing the press immediately after returning from the Police HQ having given his statement to CID on the alleged plot to assassinate him as revealed by the media recently. A taped conversation between Director of ‘Dushana Virodhi Balakaya’ Namal Kumara, and a resident in France Thushara Peiris, that was aired many times by media Channels mentioned about the assassination of Minister Rishad Bathiudeen during a ceremony in Batticaloa. Also accusations have been made saying that the French resident Thushara Peiris had provided funding/financing to Director of ‘Dushana Virodhi Balakaya’ Namal Kumara to assassinate Minister Rishad Bathiudeen and place the blame on it on the Tamil Community. Thereafter the then Minister of Law and Order Mr Ranjith Maddumabandara, at a Press Conference, had stated that a wide-ranging investigation would be carried out in this regard. As a result ACMC MPs lodged a complaint with Colombo Police HQ on 23 October on the alleged plot against their leader Bathiudeen. ACMC Leader was thereafter summoned by the CID on 12 December to give his own statement to CID on these developments. “We are against illegal appointment of Mahinda Rajapaksa MP as Prime. President Maithripala Sirisena has used a power he does not have as President, in making this appointment. It’s a severe violation of the Constitution. We will never support this constitutional violation-or any other violations. The violation could be by the President, Prime Minister or even anyone else –we oppose violation of Sri Lanka’s constitution by anyone-which is anti-democratic” ACMC Leader added.